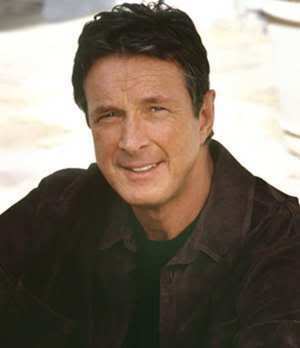 One of the most prolific science-fiction and thriller writers of our generation, Michael Crichton appeals to a mass audience. Perhaps his most interesting book, however, is completely overlooked. In 1988 he published Travels, a sort-of autobiography about his…well, travels, both external and internal. It is absolutely fascinating. He has experiences with things that I find it hard to believe in (spoon-bending, seeing auras, and psychic readings) and with things that stir the adventurer’s soul (climbing Kilimanjaro, scuba diving in Bonaire, and interacting with elephants in Kenya). As a trained scientist (and graduate of Harvard Medical School), Crichton comes at these experiences, whether physical or metaphysical, with a scientist’s discernment. His conclusions are, again, fascinating. Whatever you may think of his experiences and veracity, the book is a really fun read about a really interesting man. And the truth was, I had slept well, when I finally stopped worrying. I was impressed with the instantaneous flip in my own emotional state, from barely controlled hysteria to a detached emotional calm once I saw the giant [elephant’s] eye. For a long time I felt it was because I am a practical person who, faced with an elephant outside his tent, examines all the possibilities — to run away, to call for help, to scare the elephant off — and, having rejected them all, sensibly decides to go to sleep. But later I realized that we are all like that. We all can work ourselves into a hysterical panic over possibilities that we won’t look at. What if I have cancer? What if my job is at risk? What if my kids are on drugs? What if I’m getting bald? 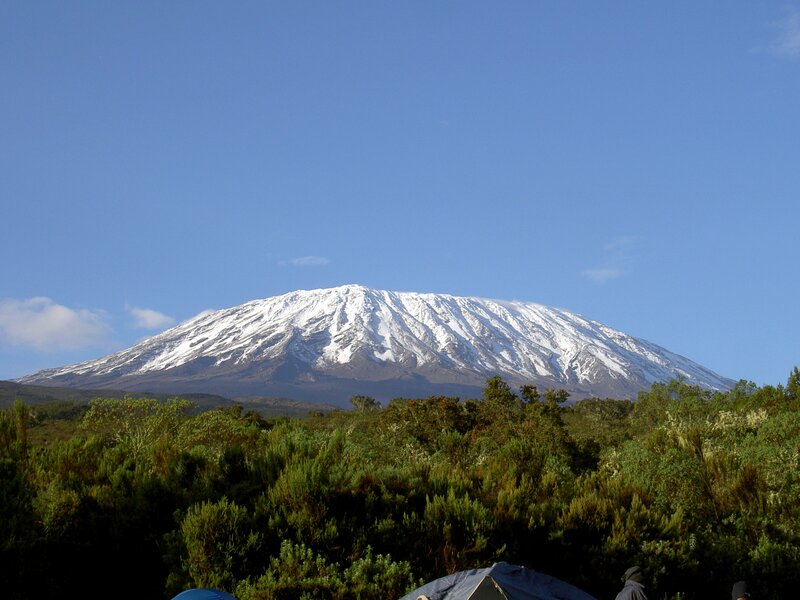 What if an elephant is outside my tent? What if I am faced with some terrible thing that I don’t know how to deal with? And that hysteria always goes away the instant we are willing to hear the answer. Even if the answer is what we feared all along. Yes, you have cancer. Yes, your kids are on drugs. 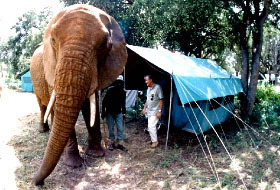 Yes, there is an elephant outside your tent. Now the question becomes, What are you going to do about it? Subsequent emotions may not be pleasant, but the hysteria stops…[t]he minute we look, we cease being afraid. I am trying to figure out what is going on inside my head. I have begun to understand that climbing at altitude is a mental process, an exercise in concentration and will. I notice that some thoughts sap my energy, but others allow me to continue for five or ten minutes without stopping. I am trying to figure out which thoughts work best. To my surprise, the mental pep talks (“You can do it, you’re doing great, keep up the good work”) don’t help. They just provoke the counterthought that I am kidding myself and will ultimately fail. So there’s a lot going on here. A very smart man interacting with his life in an honest way, and discovering that a) when the often dark truth of human existence is acknowledged, it goes a long way toward combating fear and b) self-help pep talks don’t work, and, in fact, have the opposite effect. Sadly, Crichton died last year before being able to write of the adventures of the second half of his adult life. But read Travels…it’s really great. "I am trying to figure out which thoughts work best." Unfortunately, most of evangelical Christianity is on exactly the same wave length. The RodFather does not approve. Yeah, I'm not advocating his "name it and claim it, power of positive thinking" attitude here…just think it's interesting that he finds that positive thoughts don't yield positive results. In the end, he finds that focusing on how much his legs hurt doesn't slow him down (nothing speeds him up!). It's the goal of the quest that is the problem. It is a sign of the times that this brilliant and gifted guy is basically on the same page as so many others.